If you’re looking for emotion in football, you need only walk among the sensitive so-and-sos on the terraces. That’s reflected in FIFA 15 in the dynamically-changing, club-distinguished cheers and chants of the crowd – and in the evolving relationships between players on the pitch. Goal-scoring, fouling and every other major interaction on-pitch will draw a range of reactions from each player according to their personality and perspective. We can expect to see anger and delight, weariness and happiness, sadness and serenity, alarm and excitement, surprise and disgust. But apparently EA Sports have drawn the line at ‘bitey’. Even the subs on the bench are motion-captured these days. Can individual blades of grass support the weight of ping-pong balls? Expect EA Sports to find out ahead of next year’s iteration. 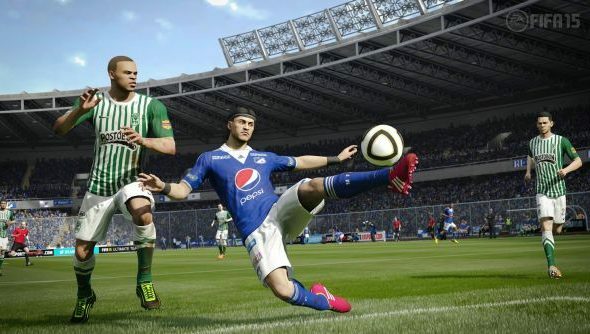 The last FIFA 15 trailer revealed that moisture can now be kicked from the turf into the air. But a quick glance at the rules of the game suggest you’ll be better off aiming for the ball instead.